There was a time when women trainers - and there weren't a lot of them in those days - weren't allowed to saddle their horses in public, meaning the normal saddling area or the paddock. And they weren't allowed on the backstretch after dark, even though their horses were there and might need special tending. And now and then they even stood the chance of being sneered at, even in victory. Thankfully, say most female trainers, those days are behind them. The "good old boys’ network" is a thing of the past in the Thoroughbred racing industry, and good riddance, they say. So is it easier these days? To some degree, say three female trainers well-known to Del Mar horse players. 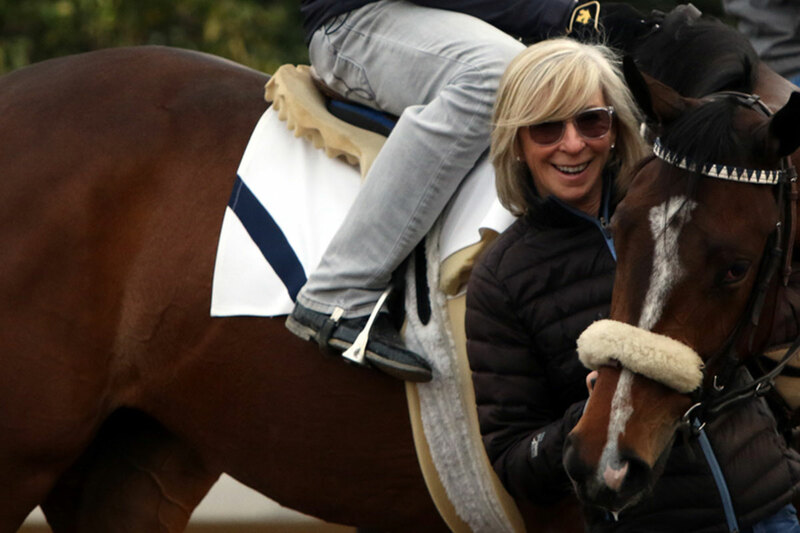 "If you don't want to make it difficult, it won't be," says Vicki Oliver, who, though based year-round in the Kentucky Bluegrass, has made her mark at Del Mar with victories in four stakes races. "Just go on and do your thing and believe you can do it as well as a man,” she says. “Just do it the way you want to do it and get respect for the way you do it." Respect has come her way at Del Mar by winning the 2014 Del Mar Oaks with Personal Diary, the 2015 CTT&TOC Handicap with Honey Lake and back-to-back runnings of the Yellow Ribbon Handicap with She’s Not Here in 2015-16. Oliver, the daughter of G. Watts Humphrey, grew up among Thoroughbreds, beginning with life at her father’s breeding and racing operation at Shawnee Farm in Harrodsburg, Ky. She cut her training teeth as an assistant to Elliott Walden during successful times before he entered the administrative side of racing as WinStar Farm president. Despite the fact George “Rusty” Arnold has been Humphrey’s main trainer for years, the owner-breeder has sent his daughter any number of nice homebreds to train, Personal Diary and She’s Not Here being among them. Vicki brought four horses to Del Mar this summer but went home without making much of a ripple where the turf meets the surf. “We just didn’t do as well as I’d hoped, but it’s always great to be at Del Mar. And I’ve had success there,” she said from her barn at Keeneland. She paired that fondness for horses with “really, really hard work” to put her in the industry. Her love for horses began during her years competing on show horses. She moved into the Thoroughbred world by galloping horses, grooming them and doing a number of other things that go with being a barn hand. “I worked my way up to assistant trainer during my early days in Northern California,” she said. “And then I went out on my own. But what Gaines sees as particularly important parts of a woman’s makeup as they apply to training is her attention to detail and nurturing nature. “I love my horses; they’re like my children. She did work with her father, Richard Mulhall, but not at the track. They worked together, instead, at The Thoroughbred Corp.’s ranch in Bradbury, close to Santa Anita, where Mulhall served as racing manager. There she dealt with horses coming off the racetrack and with rehabbing them. “I saw all kinds of injuries. I probably knew as much about legs as anyone who was on the racetrack at the time,” she remembered. Mulhall finally got to the track when, as she says, trainer John Shirreffs took her under his wing as an exercise rider. 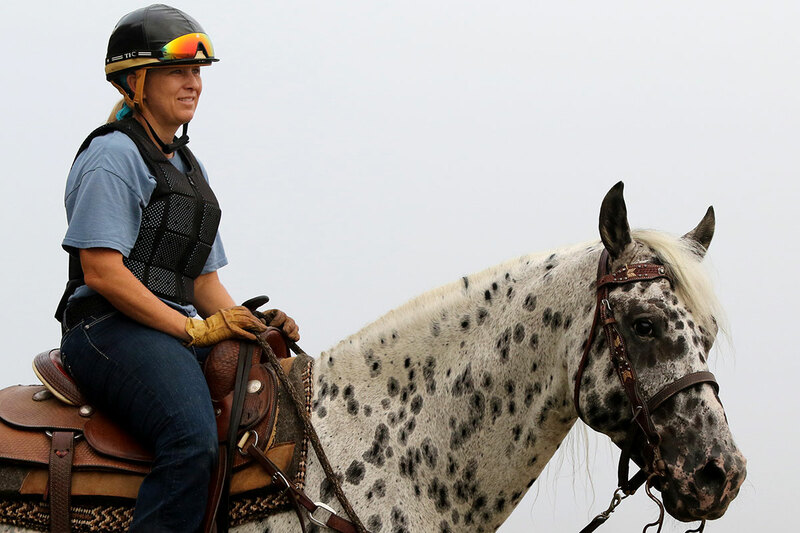 Even though she had immense experience as a rider with show horses, she remembers having to learn new things before transitioning to riding at the track. Eventually, she went out on her own with three horses. She handled everything with her trio, and her dad finally began to give in a bit. That didn’t make it any easier, though. “It was tough in the beginning,” she recalls. “There were a lot of catcalls and not much respect. I didn’t go to the backside at night in those early days. That settled down after a while and I don’t have any trouble going to my barn anytime night or day now. Through all of that, I think I toughened up a lot.